View of 0.1254 in its original frame from Mary Baker Eddy’s home. “Diana or Christ?” depicts an early Christian woman facing a difficult choice. Will she deny her faith and offer incense on the altar of the goddess Diana (the protector of the ancient city of Ephesus, whose effigy gazes down at her) and go free? Or will she choose to follow Christ and face martyrdom (with the arena of the theater of Ephesus, and the lions, a mere few feet away)? The caption explains: “Let her cast the incense,—but one grain and she is free.” The woman’s gaze is turned heavenward and her hand rests on her heart, as if she sees something beyond our frame of reference. This is a possible allusion to Stephen, who saw “the glory of God” before he was stoned to death.5 We assume that she will choose Christ; the scene captures the moment when she turns away from the pagan altar. At the same time, external pressures—like the restraining arm of her lover—are quite apparent. 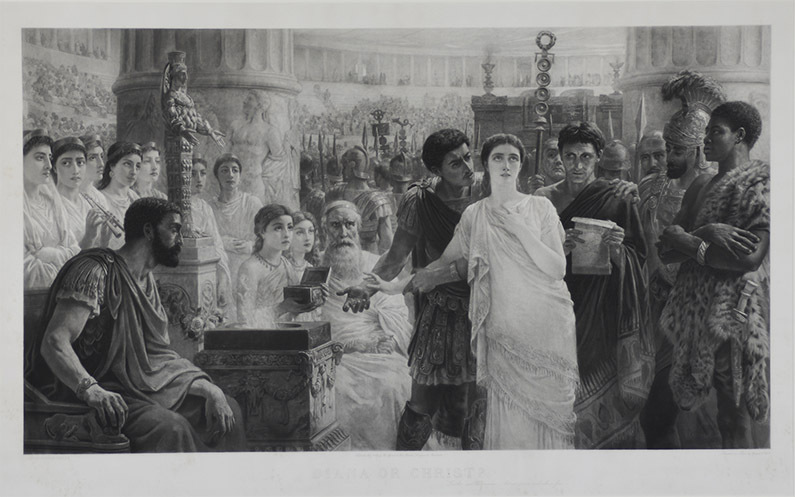 Dozens of armor-clad soldiers stand behind her, and the Vestal Virgins, witnesses of the torture of Christians in the Empire’s amphitheaters, stand to the left, their arms crossed. The Christian Science Board of Directors to Mary Baker Eddy, 26 June 1896, 002a.02.010. Published July 1st 1889 by Thomas Agnew & Sons London, Liverpool and Manchester; printed in Paris by Goupil & Co.
Stephen, Sidney Lee, Robert Blake, and C. S. Nicholls. The Dictionary of National Biography. Volume 12 (London: Oxford University Press, 1909), 102. Eddy, Science and Health with Key to the Scriptures, 254.